Usually, reflections from ground-based lights in high clouds appear as vertically oriented pillars of light. An 1887 article from the American Meteorological Journal describes the phenomenon, then referred to as "gas comets", as "bright streaks or bars of light (...), measuring on an average one-quarter of a degree in width and from 5 to 15 degrees in length" . Light pillars can be visible for minutes, even hours, disappearing and reappearing just like a light that is switched on and off. 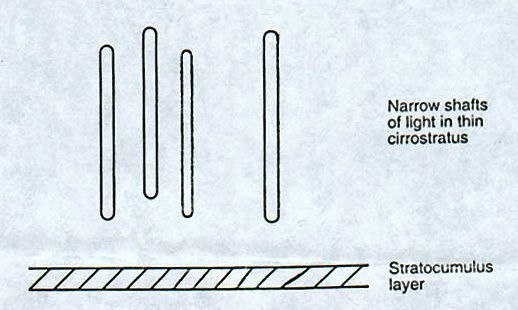 The length of the streaks depends not only on the angle under which the pillar is seen, and which is determined by the altitude of the reflecting layer and the distance between the observer and the light source, but also on the thickness of the ice-crystal cloud. Close-up images of light pillars sometimes show peculiar features. These can be due to the distribution of the ice crystals in the cloud or to the nature of the light source that causes the pillar. Clouds with different concentrations of ice crystals at different altitudes for example will give the reflection the appearance of a luminous string with brighter areas where ice-crystal concentrations are high. Because clouds move and change shape, the aspect of the reflections will change accordingly. 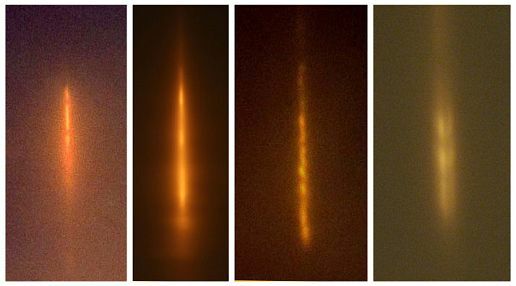 Four examples of light pillars showing peculiarities. From left to right: segmented pillar caused by a gas flame reflecting off separated ice-crystal layers positioned one on top of the other; pillar with multiple nuclei caused by the reflection of a gas flame in a thick cloud with different concentrations of ice crystals at different altitudes; rope pillar, also caused by a gas flame, but here the reason for its specific shape is unclear; combined pillar presumably caused by multiple spotlights placed close together. When multiple pillars are seen to converge on the zenith, a star shape may appear. A fine example of the latter was photographed by amateur astronomer Joël BAVAIS at Ath, Belgium, in November 2006. 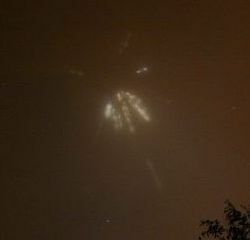 Unshielded lights created this star-shape pattern of pillar-shaped reflections in the sky over Ath, Belgium. The brightest pillars were caused by spotlights that illuminate the community's church building. Next to the common pillar shape, observers standing close to a bright light source have reported tear-drop and circular reflections close to the zenith. An example of such a display occurred on October 20, 1993, when pillar-shaped reflections were observed in combination with teardrop and circle-shaped lights from two ships and two gas production platforms in the North Sea. Reflections observed on October 20, 1993, from different locations in the southern part of the North Sea. Because of the nature of the reflecting stratum (not a flat mirror but a cloud made up of billions of tiny mirrors), light pillars sometimes appear as 3-dimensional shapes, leading observers to describe them as solid objects. Descriptions such as "a disc standing on edge", "a luminous cigar", "a bright cylinder" and "a rocket-shaped object" are regularly encountered in reports collected from the UFO literature. A vertical shaft of light extending from 19° alt. Upwards, "white at the top" and "yellow-red at the bottom", described as "a trifle thicker at the bottom than at the top", was seen at Oklahoma City on the morning of 1938, Feb. 28 (midnight to 6 a.m.), but was definitely identified by Carl Winstead, weather bureau flier, as originating from a burning oil flame in the south city oil field, reflected in a light cloud which appeared as a slight fog when the pilot went out of it at 13,000 ft. [3,962 km]. Winstead flew around and thru the light and said that from above it appeared like a flat spotlight which ended suddenly. In spite of this sensible interpretation, the newspaper report harped on the "mystery" of the light, headlined it as a "Comet or Something" and entertained notions of the "the tail of a meteor"! Sightings from locations close to the source of the reflection are rare. In most instances distances between 20 and 50 km (12 and 31 miles) were recorded. The maximum distance reported to date (July 2007) is 139 km. The sighting in question took place on August 24, 1998. While navigating through the East China Sea, Captain J.L. PETERSON and members of his crew spotted "four shafts of narrow vertical light reflected in the sky". They discovered that the reflections were caused by four flares of the Kakap Natuna oil terminal "75 n mile away" . The four shafts of light observed by Captain PETERSON from his ship in the East China Sea on August 24, 1998. The reason why light pillars in high clouds are rarely observed from short distances is believed to be that objects and lights in the sky are more readily spotted when they are close to the horizon, i.e. when the source of the reflection is located at a great distance from the observer. In cases where flames or fires are involved, the pillars usually appear as yellow or orange-red, at times with pink or blue edges or halos. In the case of a searchlight or spotlight, the pillars will look white or bluish-grey. When coloured filters are placed in front of the lamps the reflection will assume the colour of the filter. In essence, the colour of the reflection is determined by the colour of the light source. The brightness depends not only on the nature of the light source and the distance between the observer and the reflection, but also on the type of ice-crystals, their size, the smoothness of their surfaces and the way in which they are scattered within the cloud. A flat horizontal layer consisting of large ice-crystal plates with smooth surfaces will generate a crisp and colourful image, whereas a cloud of randomly scattered oscillating ice-particles of small size will produce an image with diffuse edges and a less outspoken colouring. In one of the best cases on record, a trained observer, studying a reflection from the glow of a blast furnace converter through a telescope, reported that it looked as if the flames from the furnace mouth could actually be seen moving about inside the reflected image . In the case of the North Sea sightings referred to above, a witness who used binoculars noticed that the "object" had "a granular surface, with a large number of small points inside". This is not the only case in which the light reflected off the smooth surfaces of the individual ice crystals gave the reflection the appearance of a luminous structure made up of countless points of light. Using data obtained from another witness to the North Sea incident, Erik HØG of the Niels Bohr Institute for Astronomy, Physics and Geophysics department of the Niels Bohr Institute for Astronomy at Copenhagen University, found that the magnitude of the circular reflection observed that night was close to -9 . By way of comparison: the magnitude of the full moon is -13, that of a bright star -1. Normally, the reflected images are much weaker. In evaluating the brightness of light pillars from photographs, it should be taken into account that the intensity of the streaks is sometimes exaggerated by the long exposure times needed for clear night shots. Especially in cases where petrochemical works are involved, the reflections are sometimes accompanied by a variety of sounds. During one of his personal observations, the author, standing 8.6 km (5.3 miles) from a blazing gas flame, noticed a sound resembling the pulsating roar of a flame thrower. In other cases, observers described sounds that they compared to a vacuum cleaner, a refrigerator and a helicopter in slow motion. In some instances the sound of gases escaping under pressure was perceived. High-pitched humming sounds have been mentioned as well. Observers often attribute these sounds to the mirrored image in the sky and not to its true source (which is often many miles away and invisible to them). HOOK, Joseph A. and ROBERTS, T.P., "Aerial Reflections over Burning Gas Wells" in American Meteorological Journal, Vol. IV, February 1887, page unknown. Thanks to Barry GREENWOOD for mailing us a photocopy of this article. PETERSON, J.L., "Optical Phenomenon" in The Marine Observer 69:110, 1999 (reprinted in Science Frontiers No. 126, November-December 1999, pp. 3-4). Thanks to Jacques SCORNAUX for mailing us photocopies of these items. SPERRA, William E., "A Night Mirage" in Popular Astronomy, Vol. XVI, No. 3, March 1908, pp. 164-167. At the end of his very detailed account of a series of personal observations, SPERRA writes: "the image at its brightest with the rift in the center, appeared not unlike a mirrored picture of what was actually taking place at the furnace mouth, flames made up of innumerable incandescent particles pouring forth, usually in two opposite directions". HØG, Erik, various Internet messages dated between November 1993 and May 1995.